People of color served in the Vietman war in greater numbers then their percentage of the population. Native Americans had the highest record of military service per capita of any ethnic group. 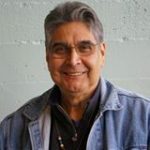 KBCS Reporter, Jim Cantu interviewed Philip H. Red Eagle of the Dakota, Sioux, S’Klallam and Steilacom tribes. Red Eagle is a Native Veteran, Writer, Carver, Co-founder of the Tribal Journeys, Co-founder of the literary journal, Raven Chronicles and author of the award winning Red Earth: A Vietnam Warrior’s Journey. Red Eagle speaks about his service, and his healing journey from post traumatic stress disorder.